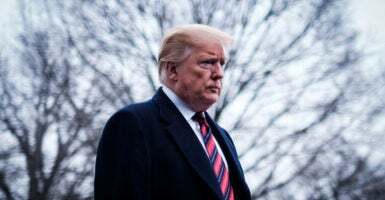 President Donald Trump stated on Tuesday that the Covington Catholic High School boys who were portrayed as the villains in a now-debunked media narrative have become a symbol of fake news. Sandmann, along with his high school classmates, were attending a school-sponsored trip to the March for Life on Friday. The all-male group of students were standing in front of the Lincoln Memorial waiting for a bus to take them home to Kentucky when a now-viral incident occurred. A short video quickly went viral showing the boys laughing and chanting around a small group of Native American protesters, including a man named Nathan Phillips. Phillips went on to news shows later that weekend claiming the students mocked him with racist insults and pro-Trump chants. The boys, who were wearing Make America Great Again hats, were quickly dubbed the “MAGA hat kids” and the incident was characterized as a racially-motivated attack. However, a longer video was released that corroborated the students’ accounts of events and debunked Phillips’ statements, a narrative that the news media largely ran with. The full-length video showed that the high schoolers did not mock or insult the group of Native Americans, but rather, a black supremacist group known as the Black Hebrew Israelites approached the students, calling them derogatory names. Content created by The Daily Caller News Foundation is available without charge to any eligible news publisher that can provide a large audience. For licensing opportunities for this original content, email[email protected]. Molly Prince is a reporter for The Daily Caller News Foundation.